So, when I set out to make dumplings from scratch last year, I didn’t have a whole lot of experience behind me. But it turns out they’re delightful. 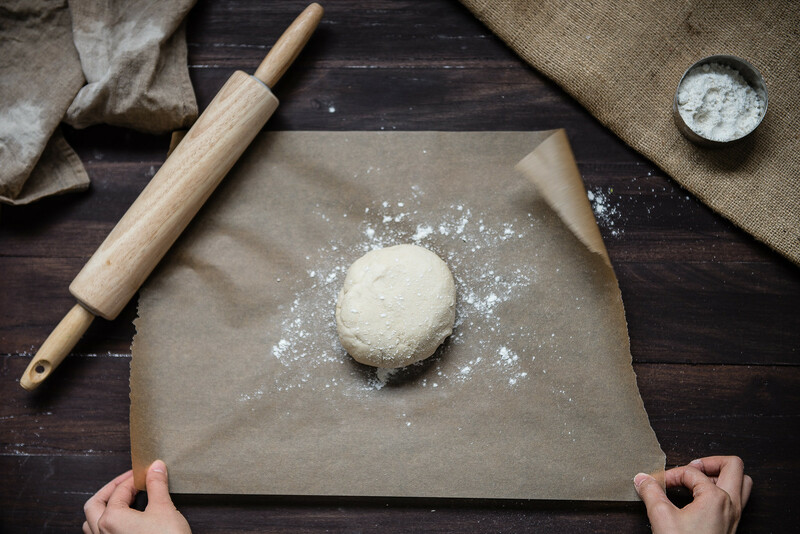 The dough is simplicity at its best, and I find the pleating miles easier than the flip-and-twist-and-seal dance that wontons call for. I think they’d be perfect for an afternoon when you have a little extra time on your hands, or a DIY dinner party (which, I guess, is why dumpling parties are a thing). You can find my take on potstickers, plus recipes for three different fillings, over at Verily Magazine this morning. Hope you’re all having lovely weeks! « bacon & sweet corn ice cream sandwiches // my name is yeh x trb! Is it bad that all I can think are a) I loved eating frozen dumplings and b) all that flour in the crevices of the table!! I don’t envy the cleanup…(I clearly have a strange thinking process). GASP. these photos are INSANELY amazing. i am so sad that we didn’t know each other when i lived in brooklyn… i had many many dumpling parties. Ahhh! You’re insanely amazing <3 Esp for all those dumpling parties -- I feel so post-facto deprived :'( We are such star-cross'd neighbors. Omg. I want a dumpling party right now. Ours was totally a wonton/dumpling mash up household–my dad always made the wontons and my mom made the potstickers. Our weekend lunches were always the best too! It’d either be ramen with wontons or Annie’s mac n cheese. Omg so good! THESE PHOTOS ARE SO SO GORGEOUS. I love it!!! Such efficient division of labor 😉 (Also, yesss Annie’s mac and cheese!) Thanks so much, lady! Thank you so much, Medha! Me too 🙂 And folding them by hand was kind of therapeutic in a way — comfort in more ways than one! YES. I have been wanting potstickers. The recipe looks much easier than I imagined. So much love for these pics, girl! 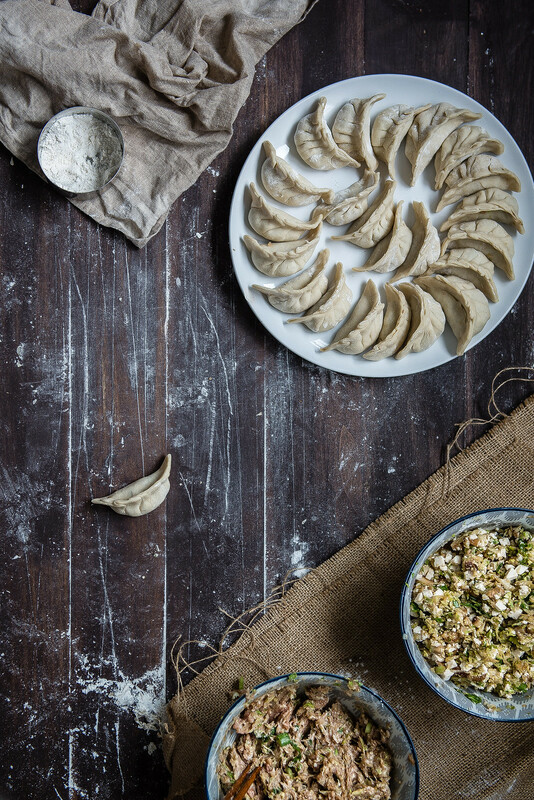 but you’ve inspired me to do a dumpling post this fall…after putting it off for four years. thanks for this – so, so beautiful. I love this comment so much! Family food memories are the best. I feel like they’re so often the most vivid. Our wonton nights sound so similar! My dad folds while my mom cooks (and I “fold,” but about 15 times slower and with results 1000 times more misshapen). Also, I got a big kick out of your biscuit-cutter comment. I used to do it the traditional way, but I think I’m too lazy… Hahaha. They look so delicious! They sound much easier to make than i thought – Will definitely try these soon, can’t decide which filling I should start with! Beautiful pictures and composition – love the lighting! Right? I thought they’d be much harder too! If you give them a try, I’d love to hear how they turn out 🙂 Thank you so much, Medha! 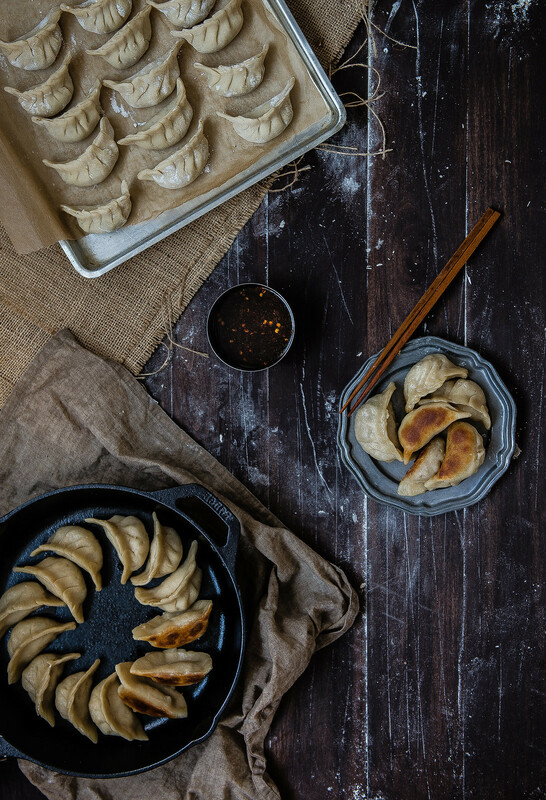 These dumplings sound amazing, the photos are beyond amazing (honestly, just how talented are you, lady?!? ), and I’m pretty sure these taste incredible as well. Actually, I’ve been dreaming of your buns ever since that post, but lately, I’ve been thinking of them even more. Unfortunately, as I’m living a cottage life right now with limited kitchen space and facilities, I have to wait until I’m back in the city. Can’t wait to make some buns AND dumplings. I guess I have to throw a party. Aw, Sini! You always make me blush. I would fly out to Finland for a blue & white kitchen party!! Can’t wait to hear what you think if you end up trying these (or the bunz!) <3 <3 until then I hope you have a magical time at the cottage! OK, I have to admit I had a little fangirl moment when I saw your comment, Gabriel!!! So obsessed with your gorgeous blog <3 Thank you so much for stopping by!!! 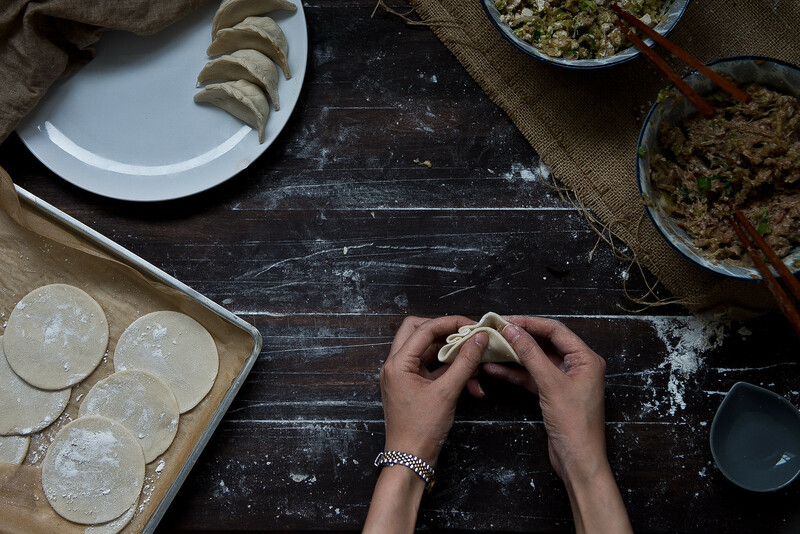 I’m so slow at shaping dumplings — I have never gone as far as making my own wrapper dough to add to the workload! But this is inspiring me to try it finally! I liked the sweet story of your weekend lunches. And you made this whole process look absolutely gorgeous! That makes so much sense! Not needing water for sealing really would save time. Thanks for your expertise! Gorgeous potstickers, these look so good! Want. Potstickers. Can’t. Talk. Want to eat! I checked out the potstickers – they sound great. Esp. the tofu and vegetable. And your photographs are lovely! Yummmmm what pretty potstickers!!! Re your note about dumpling parties, I once attended a dumpling party that ended up in like 6 hours worth of backbreaking labor as we rolled and folded over 300 dumplings. I think I had blisters on my hands by the end of it. Was it worth it? Yes, yes it was. Why have I not made my own potstickers yet?? These look incredible. MUST MAKE! Cynthia, you are AWESOME (duh, we knew that already)!!!!!! I have printed the recipe out and plan on making these this weekend! I have this obsession with dumplings (or potstickers as you guys, over the pond; call them?) whenever I can get them I will.. I used to buy frozen dumplings but then overnight they became ridiculously expensive! This recipe looks so easy.. If I can learn how to make them I will be so over the moon and you will be my bestest friend forever and ever! Really, really, really, really want these right now… Really. 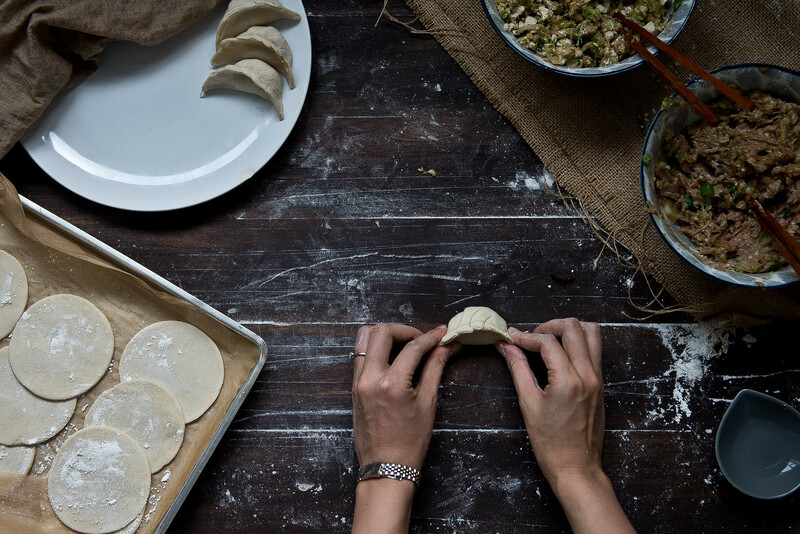 Love the idea of a dumpling party – it totally makes sense to make a whole lot once you decide to cover every inch of your kitchen in flour (which is what inevitably happens when I make dumplings). I have only made potstickers once and they were nowhere near as perfectly pleated as yours but so so delicious! 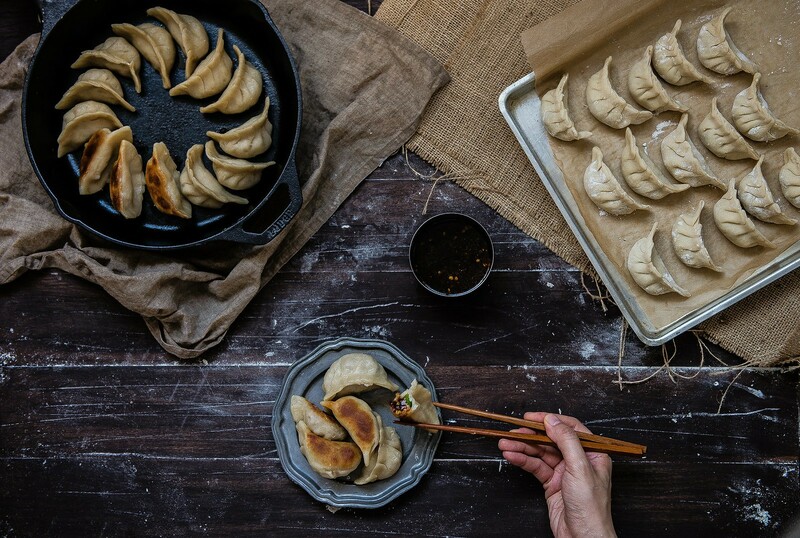 Wonderful photos and now I just want to have a dumpling party! Your dumplings look amazing! I’m so intimidated by wrapping dumplings, although I’ve seen my parents make them so many times. It’s shame that I still cannot wrap beautiful dumplings although I grew up in China… I really agree with you. I need a bit time and some practice on my own! this recipe definitely brought back some childhood nostalgia when all i would eat is gyoza! saving this recipe to recreate.. thanks for sharing another great idea and for providing much inspiration! Gorgeous pictures!! Those dumplings are so perfectly formed!! i didn’t even know there was a rice paper wrap style dumpling. mind blown. let me know when you post it, if you get around to it! i trust your dimpling skills way more than i trust my own, ha! Potstickers are some of my favorite things ever – you are such a BAMF for making them! Thank you for sharing this wisdom!!! Robert is a little Chinese-food obsessed and we are both fried dumpling-obsessed, so this has been on our to-do list for a while as a “cooking date night.” Maybe we should just throw a dumpling party though ….